FEP member Bill Butler, known on our forums as Blue86, has been a part of our community for nine years now. Not only does he have one of the best examples of how to do a themed car right, but he has served as an incredible source of information for period-correct Ford Motorsport SVO items. 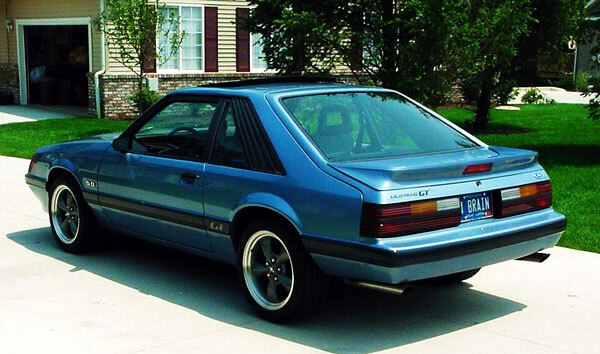 Bill's 86 Mustang GT is like a rolling Motorsport catalog, inspiring "gotta-have-it" reactions any time it is seen by 80s Ford enthusiasts. The car is a well-known community favorite and we're proud to showcase it as April's Ride of the Month. FEP: Your car is unique in that it has become a showcase of period-correct Ford Motorsport upgrades and accessories. When did you start picking up Motorsport items and did you know at the time that this would become the direction your car would take? Bill: My father is a retired Ford engineer. He worked at Ford for forty years. In the eighties he worked in engine development and SVO. I was fortunate that he was always bringing home various performance parts and Ford Motorsport accessories and memorabilia. 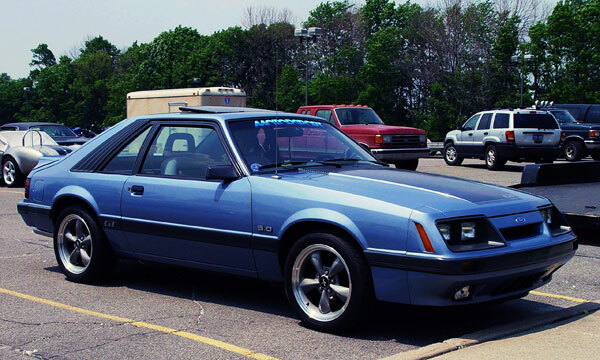 Over the years I've owned nine Fox Mustangs (all '79-'86 by the way). Many of my Motorsport parts were used on multiple cars. I'm sentimental, so I was careful to remove many of them when I would sell one. Parts accumulated in my parents' garage and basement as well as at my own house over the years. My parents decided to move when my dad retired, so I inherited all of his parts and FMS items. Combined with what I'd already collected, it was a lot of stuff! When I bought my current GT, I thought it would be cool to use all of the vintage FMS parts & accessories I had accumulated and build the car with period-correct items like I would have done if I owned it back in the '80's & early 90's. Although I had a lot, it has taken me a decade to find many of the rare parts that are on the car. I decided that any part added to the car would either be original Ford or sold in the Ford Motorsport catalog. I've held true to that in my build. I could not have done it without help from many friends, family, neighbors and connections with current and former Ford employees. Many thanks to all of them, especially my Dad! How many Motorsport parts do you have that aren’t displayed on the car? My collection has almost 500 items in it now. Most of them are from the U.S., but I've also picked up quite a few cool things from my travels to Europe as well as some from Australia. There are 177 parts from the Ford Motorsport catalog on the car itself. When was the car purchased, and why? I found the car on e-bay in 2003. Actually, I found it on accident. I was typing fast and misspelled Mustang in my search. I typed “Musrang”. I watched the listing and the spelling error was never corrected. At the end of the auction the price was ridiculously low, so I put in a bid and won the car. I drove it home from Ohio. What parts of the car are completely original? It still wears its original paint and trim. And what's modified or upgraded? Most of the car is modified now. 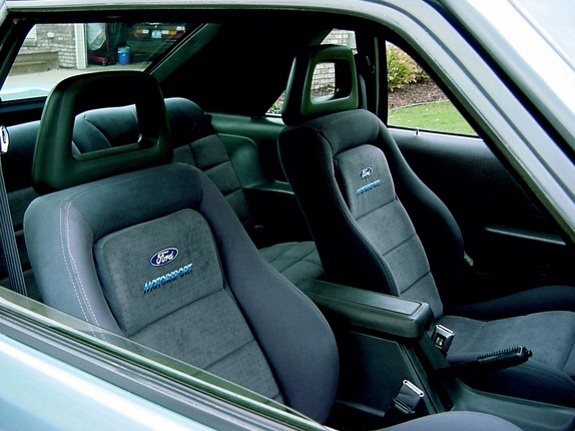 The interior has been modified with FMS front seats, original Mustang SVO rear seats, carpet, hatch trim and hatch carpet. I've also added an FMS leather steering wheel, horn pad, shift boot, shift knob and floor mats. Plus, the factory console info display was replaced with an FMS performance timer. There are still a few other changes planned for the interior. As far as the exterior, I've added SVO taillights, FMS fog lights & covers, FMS/Saleen quarter window decals and “Motorsport” windshield banner (taken from a vintage FMS stripe kit), FMS mud flaps and license plate frame. I am also adding Mustang SVO sail panels and rear bi-plane spoiler(s). 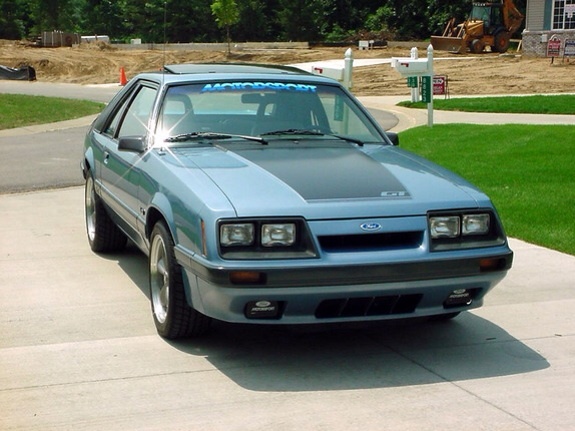 Plus, a FMS hood scoop (same as '83 GT). Visually, the newest thing on the car are the wheels. They are 17” 2001 Bullitt wheels which were purchased from the Ford Racing catalog. They were needed to clear the rotors and fit the lug pattern on the FMS Cobra brake kit. It also has FMS springs, Koni shocks, struts & quad shocks (from the FMS catalog), strut mounts, lower front control arms, upper rear control arms and Mustang SVO lower rear control arms. Plus, various other FMS suspension components. The chassis has been reinforced with FMS sub-frame connectors, strut tower brace and chassis stiffening kit. To offset the weight, OEM aluminum front and rear bumpers & supports have been added as well as a Cobra aluminum spare wheel & tire. Plastic headlights have been added as well. Future plans call for installation of a FMS tubular k-member, control arms and coil-over front suspension. Currently the car still has a 5.0 with modified drivetrain. It has FMS heads, GT-40 intake, throttle body, injectors, camshaft, rocker arms, valve covers, pulleys, headers, radiator, clutch, transmission, driveshaft, etc... The entire rear axle has been strengthened and modified using all FMS parts as well. The exhaust consists of a stainless steel Ford Motorsport H-pipe and FMS mufflers and tailpipes. There are many other parts not mentioned. A stroked Windsor is close to being completed for installation next year. It will have a FMS supercharger also. Any particular challenges in getting the car to its current condition? Locating rare and NOS OEM Ford parts and Ford Motorsport parts. How about outside recognition at car shows or magazine coverage? It has won numerous awards at MCA & SAAC shows as well as various local and state shows in Michigan. It will be photographed and featured in a magazine in the near future. What led you to make the car what it is today? It's been more of personal vision in making the car like it is. As a reminder of the past and my youth, as well as a sentimental connection to friends and family. It is still a project and a work in progress. As long as there are still cool FMS parts to find and add, I'll do it as long as I can. Any other special stories you'd like to share about the car? Shortly before I bought the car, a very good friend of mine died. He was only 31 years old. We grew up across the street from each other. I got him into Mustangs and we raced and worked on our cars together. He owned an '85 GT when he died. It has since been passed on to his son. His name was Kevin, but his nickname was “Brain”. 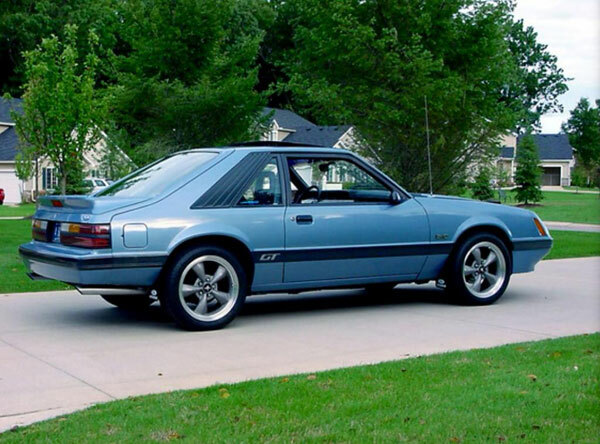 We both always loved Light Regatta Blue, and this was another reason I bought my GT. My car is dedicated to Kevin. My license plate reads: “4BRAIN”. Many thanks to Bill for supplying lots of pictures and great answers to our questions. We'll all be looking forward to seeing this car on the boards, at shows, and in a magazine. Beautiful car! Congrats on ROTM! Great job will all the period correct FMS items. Congrats! I love everything about that car. Congratulations! Luv those wheels and the seats ... and everything else! Bill, beautiful car. Congrats. I love everything about the car. Don't do the bi-wing though! Congrats Bill, such a beautiful car, lots of nice touches and can't wait to see you go further with it! Thank you for the comments! Thanks also to Skye for doing all the work and putting together a great write-up. Also, to Chris (Red Lord Amazon) for nominating my car, and for everyone who voted for it! Considering all of the amazing cars on this site, it's an honor. I really appreciate it! As always Bill an absolutely Awesome car ! A Fox that is a terrific example of how all those FMS parts can come together and just make Every aspect of the Mustang even more enjoyable ! Though unlikely, I would sure love to see this car in person someday. Definitely ROTM material. Congrats. Beautiful car, Now that is one fine Fox. Hey Bill, Congrats! This will be the perfect Motorsport Mustang when your finished. Wait, we're never finished are we?